Bandleader Tommy Dorsey gave the the name Sentimentalists to two different vocal groups who sang with his orchestra in the 1940s. Having originally used the name for a small grouping of his musicians who recorded jazz music at the turn of the 1940s, he first applied it to vocalists in early 1943 when he hired the Clark Sisters to replace the recently departed Pied Pipers. Dorsey changed their name to reflect his own nickname, the Sentimental Gentleman of Swing, though they were still often referred to as the Clark Sisters. 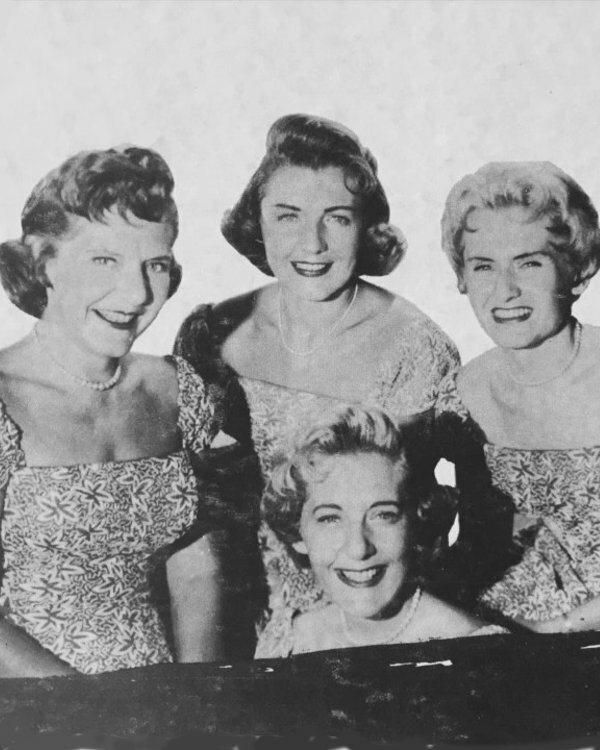 The four siblings remained with the band through April 1946 when they left with Dorsey’s blessing to feature on his Mutual radio network sustainer program, Endorsed by Dorsey. The group at that time changed their name back to the Clark Sisters. They subsequently recorded with Dorsey’s band in late 1947 sometimes using their own name and sometimes the Sentimentalists moniker. The second Sentimentalists, a Canadian quintet consisting of George Deane, Ronald Martin, Alice Masker, Barbara Babineau, and Joe Duffy, joined Dorsey in September 1948. They recorded with the band but didn’t stay long. Dorsey also used the name Sentimentalists again in the early 1950s for a small grouping of his musicians. An R&B vocal group of the same name recorded on Manor Records in 1946 but was not related to Dorsey’s unit. The name Sentimentalists was also later used by a doo-wop ensemble. “TD Denver Orph's First Flesh Act in 4 Years.” Billboard 1 May 1943: 20. “T. Dorsey Plans 12-Concert Tour.” Billboard 27 May 1944: 13. “Sentimentalists Now Clarks in Switch to Dorsey Airseg.” Billboard 4 May 1946: 47. “On the Stand: Tommy Dorsey.” Billboard 9 Oct. 1948: 40.